Nephi2, the son of Helaman3, served as chief judge for ten years, from the fifty-third to the sixty-second years of the reign of the judges (39–30 B.C.). His time was disastrous for the Nephites. 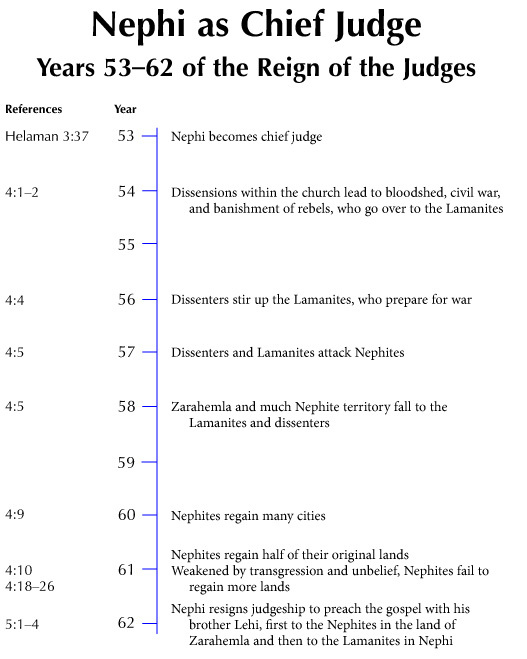 Civil war, pride, wickedness, and weakness led to the loss of the city of Zarahemla and many other lands, even half of all the Nephites' possessions (see Helaman 4:5–10). Like Alma the Younger, his great-grandfather, Nephi2 resigned the judgeship to attempt to improve this situation by preaching the word of God.